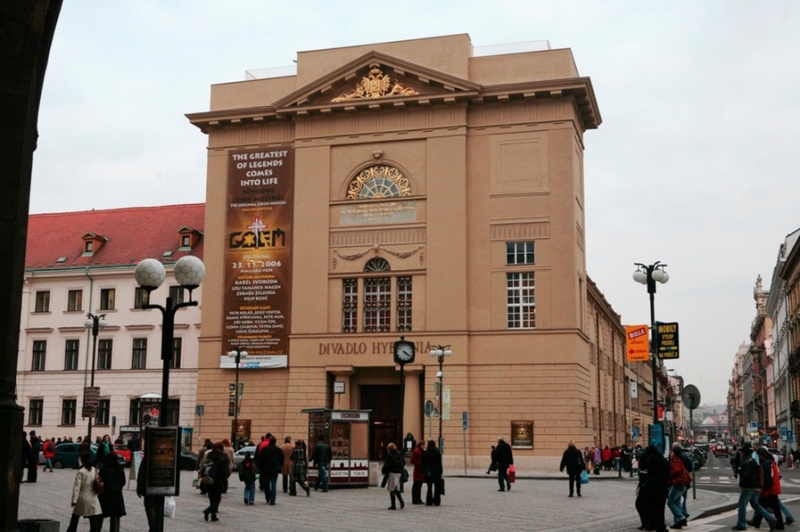 The Theatre Hybernia is situated in the center of Prague at „Náměstí Republiky“ Square, near to subway station „Náměstí Republiky“ (line B), opposite to the Municipal house.The building was bulit in the 17th century as a baroque church of the Saint Ambrosius. After successful reconstruction, Theatre Hybernia was reopened on December 2006 like modern, air-conditioned theatre/concerts hall with 1000 seats, 2 restaurants, 4 bars and summer terace. Palace Hybernia has a varied history. Is is situated in a remarkable place, opposite the Powder Tower and once opposite the Royal Palace that used to be on the site of the current Municipal House. The House had been here even efore ghe foundation of the New Town by Charles IV and in the 14th century it was an Ambrosian monastery. After the Thirty Years War (1618 - 1648) Ferdinand II allowed the Irish Franciscans to establish a college on the site of the desolate monastery. Since this time the house has benn called U Hybernů. The construction of the baroque church was begun in the middle of the 17th century, however it was considerably domaged by the Prussians. In 1785 the monastery was dissolved by the reformatory Emperor JOseph II. The building has been secular ever since. At he end of the 18th century it was used by the Czech Theatre Society, however following the death of its owner, Earl Seers-Sporcek, it was converted into a customs house. The present Classical appearance ot ghe building dates back to 1806 - 1811 and it is the work of the Viennese court architect L. Montoyer and the professor of the Prague Technical College J. Fischer. The building served as a place for exhibitions in the 20th century and only in 2006 was dilapidated building saved by the Hybernia Theatre project. The presbytery was replaced by a stage and the whole area offers an extraordinary experience. The roof terrace offers a unique view of Prague and a feeling of "finding lost time". Subway - Yellow line B - station " Namesti republiky "